As almost everyone knows, the craft beer experience continues to expand into all parts of Portland. I'm talking about the breweries, pubs and related establishments that seem to be popping up all over the place. It may seem crazy, but it's also good business. 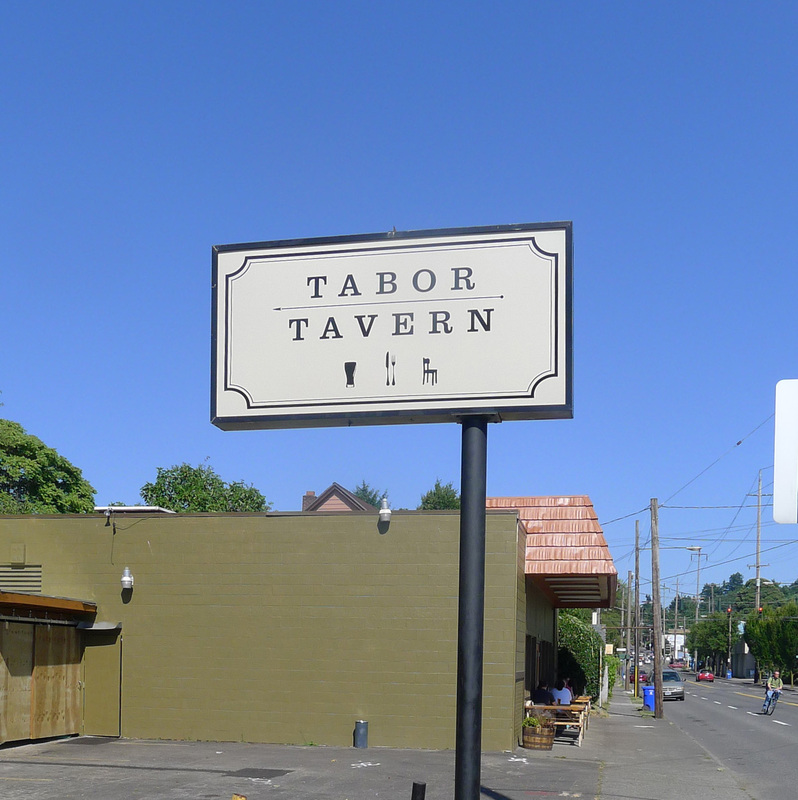 A case in point is the new Tabor Tavern on 53rd and East Burnside. The place opened about two weeks ago and they are staying busy. This area was ripe for some kind of pub. Why? Because options like Laurelwood, the Horse Brass and Belmont Station are a hoof from this neighborhood. Nearby residents now have an option that is easily reachable on foot. Owner Ken (Zig) Naffziger is the driving force behind this project. He has some 25 years of industry experience with McMenamin's, Horse Brass and Lompoc. Like a lot of people in this business, he always dreamed of having a place of his own. Earlier reports had TT opening by mid-May, but they obviously ran into things that delayed things a bit. They're up and running now. They serve up a nice list of craft beer from 10 tap handles. There's also a full bar and wine. 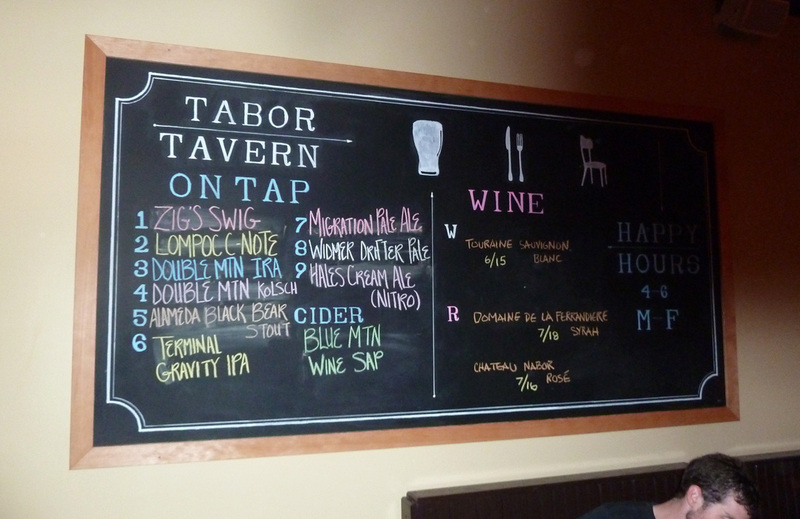 The beer list includes Zig's Swig, a Lompoc brew brewed specifically for TT. It will evidently be a fixture here, though the style will change depending on the season...lighter in summer, darker in winter. 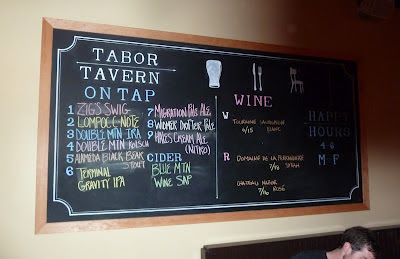 Naffziger expects to have two Lompoc beers on tap continuously. Other taps will rotate. The menu is what they call classic tavern fare. It isn't as expansive as a lot of pub menus you'll see, but the items seem smart and well-chosen. 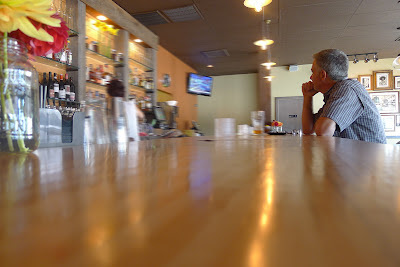 In planning the food offerings, Naffziger leaned on his own experience as a pub manager, as well as what he's seen on his travels of the world. His wife, Kristin, and Lompoc head brewer Bryan Keilty were also involved. Open hours were a bit spotty during their first week. I stopped by several times in the lunch-o'clock zone and found them closed. That was merely a logistical issue, apparently. They are now open more standard hours and building their lunch business. I stopped in twice during evening hours and found the place packed both times. The outside tables with lined with people on two warm nights. Inside it was noisy...about what you'd expect for a place that's pretty open. I ordered a Tabor Burger and Double Mountain IRA on one of those visits. The burger was terrific, although the fries were not quite what I'd hoped for. I suspect they will figure that out. No need to talk about the beer. 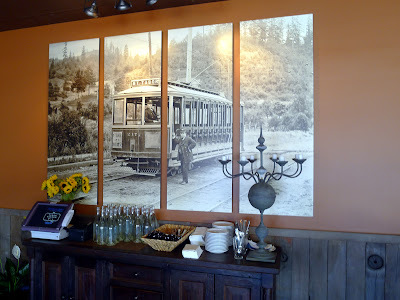 One of the cool things about this place is the historic photos that adorn the walls. There's a large picture of a Mt Tabor streetcar taken many moons ago on one wall and a collection of smaller photos on another. 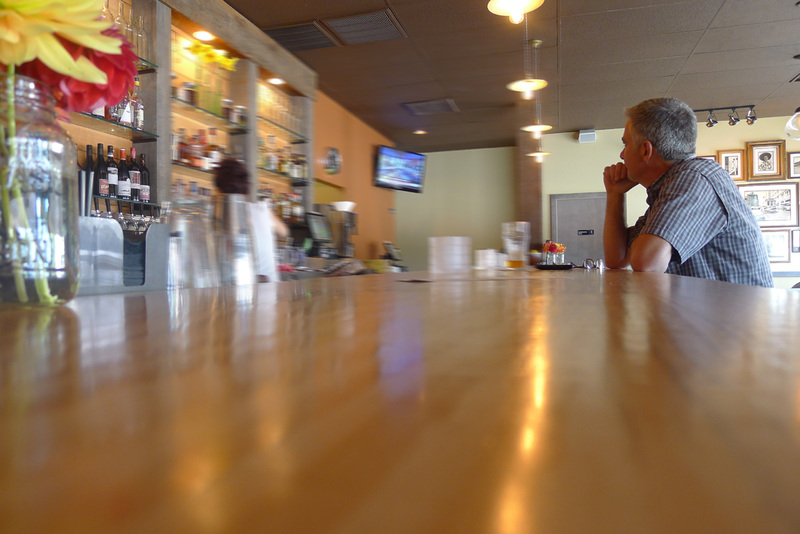 It's all about connecting the pub with the neighborhood, Naffziger said. If you have an historic photo you'd like to see hung in the pub, bring in a print or negative for Naffziger to see and it just might happen. Oh...if you're arriving by car, there's a small parking lot next to the pub and lots of street parking. Cyclists will be pleased to learn that Naffziger has ordered a large bike rack, which he hopes to have installed in the next few weeks. Parents will be pleased to learn kids are welcome until 8 p.m. I expect this place will do increasingly well as the word gets out. Nice, inviting, seemingly heart felt review.